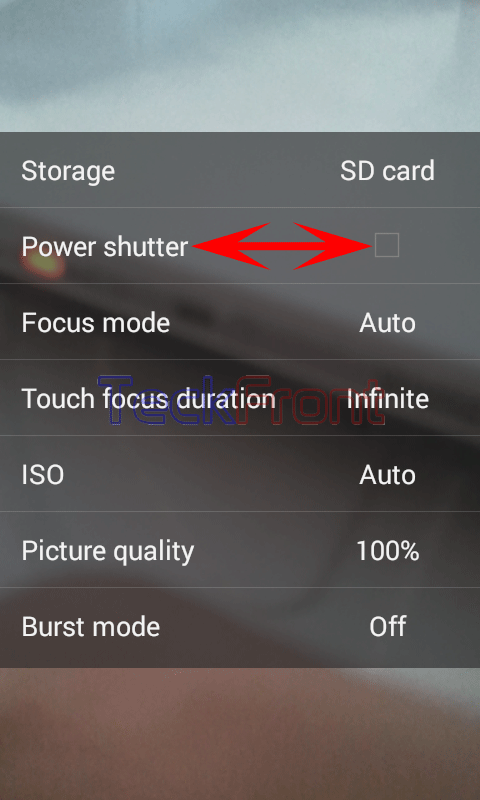 How to Set Power Shutter for Taking Snaps in Android 4.4.4 KitKat Device? To take snaps with the on-screen shutter may be a problem for many people. Keeping in view the issue, the Android 4.4.4 KitKat OS has introduced a typical feature in it. When set, you may enable the power button of your Android phone to be used a power shutter. This feature not only helps to focus on the view but also avoid the issue of losing focus while touching the on-screen shutter. It is easy to convert the power button as power shutter if the instructions are followed. But remember, when the power button is enabled, some of the normal options of the power button may not be working on some of the Android phones. To return to the normal working of power button operable, you will need to uncheck the power shutter option. Command Line: Camera app > Settings – Camera Screen > More Options > Settings Popup Menu. 1: Follow the Command Line to open up the ‘More options ’ popup menu. 2: See the status of the ‘Power shutter’ on the ‘More options’ popup menu. It is not checked, i.e. not enabled. 3: Tap the ‘Power shutter’ option to check and enable. From now onward, you may use the power button of your Android phone as power shutter to take snaps, instead of on-screen shutter. Newer How to Set White Balance for the Best Picture Quality in Android KitKat? Older How to Enable Location of Camera Snaps Taken with Android 4.4.4 KitKat Device?